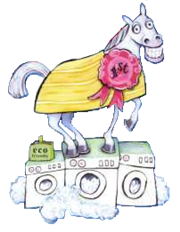 Homepage | Georgie's Horse Laundry | The 1st Choice for all your equine laundry needs! How do YOU choose who’s best to service your horse rugs? Price ? Peace of mind ? Convenience ? If you are busy just complete the details in the box on this page – Georgie’s Horse Laundry will reply rapidly with a quote. If not have a quick browse through the website and see why so many customers return year after year - peace of mind and convenience as well as good prices for the job we do. Do you have any second hand rugs you no longer need ? If so we'll collect them when servicing your rugs and clean and repair them for Rescue Horses and Ponies. Please tell your friends – we are on Facebook - Georgie’s Horse Laundry. Please like us and spread the word.